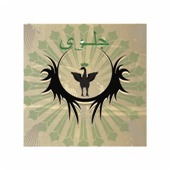 DHUL-QARNAYN from the Kingdom of Bahrain is one of Shaytan Productions's selected acts. The Arabic phrase Dhul Qarnayn has many meanings such as he of the two horns, he of the two generations, he of the two centuries, he of the two kingdoms and as a totality it is the device Learza used in order to communicate with Satan without the interference of other weak beings of frail contamination as it is stated in Shaytan Productions' website. Jilwah, the one and only composition of this EP, is a 27-minute composition of eastern ritualistic ambient music which gives us a taste of the ancient eastern atmosphere. This is a difficult-to-listen composition for a Metal fan with the classic meaning of the term as it doesn't contain the use of electric guitar or drums or anything with the classic Metal concept whatsoever. Jilwah is a composition with eastern ethnic roots which starts with incantations and Arabic unholy prayers, something which sounds like hammers forging weapons and also a game with the sound of rain and women choir chanting a'capella in Arabic. Quoting from the site, Jilwah is listenable only for those who are willing to meditate upon the black book of Al-Jilwah. So it is an interesting composition of a man who uses music as a means to come in contact with unholy spirits and I suggest you don't listen to it unless you are open-minded and like ethnic roots music and the eastern taste is welcome to your ears.